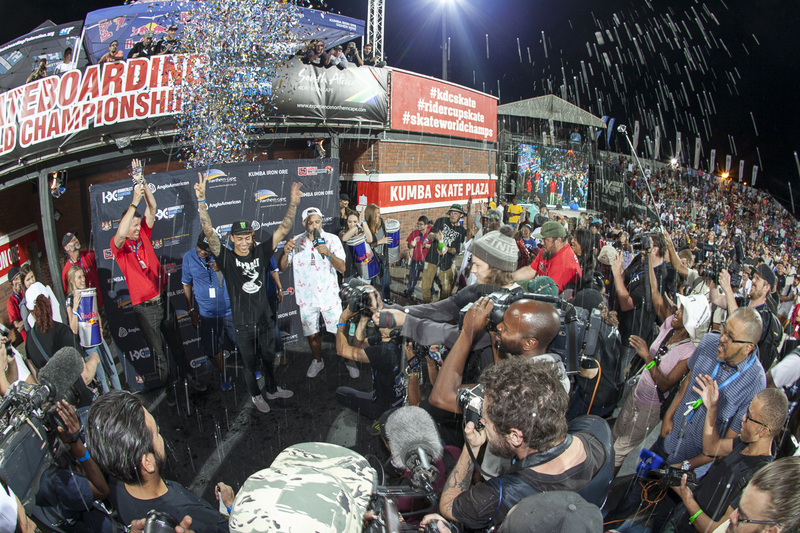 (Kimberley, South Africa – October 10, 2015) – The 2015 Skateboarding World Championships at the Kimberley Diamond Cup concluded today as 12 of the world’s best street skaters, from eight countries, competed for the world title and $100,000 top prize. Under the lights at the world class Kumba Skate Plaza, sold out, standing-room only crowds cheered wildly as the top skaters in the world competed in fierce, head-to-head battles. The Top 12 skaters in order of their scores in the qualifiers were Luan Oliveira (Brazil), Nyjah Huston (USA), Yoshi Tanenbaum (USA), Chase Webb (USA), JS Lapierre (Montreal, Canada), Vincent Milou (France), Jost Arens (Germany), Tommy Fynn (Australia), Dlamini Dlamini (South Africa), Tyson Bowerbank (USA), Gustavo Servin (Mexico), TJ Rogers (Ontario, Canada). The final heat put Luan Oliveira head-to-head with Nyjah Huston. The excitement in the air was palpable as the two faced off. The Kimberley, South Africa crowd was on its feet cheering throughout the intense five-minute battle. “Congratulations to Nyjah – that was really hard. I thought I was going to pass out. I literally could not breathe,” said a still-winded Oliveira who collapsed on the course after the finals. When the scores were tallied, just two points separated the final two (97.08 to 95.07). Huston edged out Oliveira by landing difficult rail tricks with few falls. While Luan had the best performance over the semi-finals and finals, he had several falls in the finals that made the difference. This year the World Skateboarding Federation, which sanctioned the Skateboarding World Championships, provided financial assistance to over 50 skaters to help them pay for travel expenses to South Africa. WSF is committed to supporting skateboarders around the world and is leading the charge to organize skateboarding in advance of its potential inclusion in the next Olympic Games. The final day of the World Skateboarding Championships kicked off with the South African Am Skateboarding World Championships and Top Grom Championships. The day then moved onto the South African Championships. Twenty six skaters competed in the finals by earning a top place in one of World Skateboarding Grand Prix’s nine qualifying events held throughout South Africa. The competitiors represented the best up and coming skaters in the nation, all between the ages of seven and 13 years old. With the recent news that skateboarding is among the top contenders to be considered for the 2020 Tokyo Olympic Games, this year’s world championships took on a special significance and many of the competitors were asked their thoughts on skateboarding in the Olympic Games. Nyjah Huston: Switch frontside feeble grind down the handrail. Backside flip the long way over the gap on the stairs. Nollie backside 180 to forward on the A-frame rail. Luan Oliveira: Kickflip over the entire manny pad. JS Lapierre: 270 lipslide to 270 out on the A-frame rail. Yoshi Tanenbaum: Laserflip down the big four. Click here for the full results including scores from the entire 2015 Skateboarding World Championships at the Kimberley Diamond Cup. For the full 2015 Kimberley Diamond Cup Schedule of Events and Results, visit www.KimberleyDiamondCup.com. Follow KDC on Twitter, Instagram and Facebook. The official hashtags of the 2015 Skateboarding World Championships are #worldskatechamps and #KDCskate. Check out the official event photostream at www.Flickr.com/photos/kimberleydiamondcup.